I don't know if it's just my advancing years but increasingly I find new technology and the direction it is going in completely incomprehensible. Phones are becoming so complicated that they can now only be understood by teenagers. But the topic of today's rant is computer sound cards. One of the reasons I prefer a desktop or tower PC in the shack is that you can install additional soundcards in them. This allows you to interface with one or more radios for digital modes, EchoLink and so on and still have normal computer sound available. Yes, you could do this with a laptop and external USB soundcards. But it has always seemed to me to be better RF practise to have the digital electronics inside the nice tightly screened metal PC case with only screened cables going from the PC to the radio. USB looks like a radio amateur's nightmare with these often unscreened cables carrying high speed data and the USB devices usually in completely unscreened plastic cases radiating digital hash everywhere. In fact I would not be surprised to find that the proliferation of USB devices is mainly responsible for the increasing HF noise environment that one day soon will result in my giving up HF altogether. I understand that some people might want these features but those who didn't want them weren't forced into buying them because more basic products were available. Who decided the simple, stereo 16-bit soundcard without 3D special effects such as computers had for years was no longer needed by anybody? I sympathise with you Julian, the 7.1, 5.1 ... etc is surround sound stuff as far as I am aware. These new cards have all sorts of digital effects built in which will need to be disabled to be used properly with Amateur digital modes. Having a nice "theatre hall" effect on the PSK31 signal leads to a few interesting comments. It seems the feature creep which most technology goes through is very manifest in sound cards. I ran a VR500 handheld HF radio over my laptop PC setup and the USB cables (being screened) were actually relatively clean of RF. The noisiest parts of the system were the switching PSU adaptor, and strangely the external USB keyboard. The cable connecting the keyboard was clean but the keyboard itself was an antenna. One possible use for that high end card is that due to the high sample rate, you can see a wider bandwidth of digital signals in the waterfall, and if you ever decided to go down the SDR route, you could use that card for a good I-Q demodulator. Neither of those really appeal to me, as I can't see the utility of an SDR when my radio does a fine job, but like the red queen in alice in wonderland - some people think you have to run headlong to stay in the same place. Well back to taking in the sun, doing nothing and damn proud of it! One of my concerns with these new sound cards is whether you can use them without all these effects in place. For digimodes or SDR you want the audio to be mucked about with as little as possible. Even my computer's on board sound card supports surround sound stuff. The driver program had preset options for "Classical", "Rock" etc. but there wasn't one for "Digimodes" or even "Off." I'm starting to think that people will choose SDR technology not because they think it is better but because it will be easier to interface to a computer than analog rigs. The newer SDRs don't use a sound card, they connect direct to the computer (via USB) where everything is handled by dedicated software. They will of course risk the obsolescence I've been concerned about if the software that supports them won't run on a newer OS. But it seems that today's hams are more willing to treat radios as consumer disposables that they will replace with something better in a few years so they are more interested in fully exploiting the technology that's available now than worrying about whether the gear will still be usable in 10 or 15 years time. I couldn't agree more Julian. I'm quite a fan of using yesterday's technology, as it often means that you get all the functionality you need at a fraction of the price. On top of that, the established technology has usually been well documented so that if you do run into any problems, it is easy to figure out the solutions. As for the increasing amount of noise on the HF bands, it is tragic. I dream of living in a remote noise-free environment. From a radio point of view it would be heaven. The reality is that I would find the lack of access to amenities and other people to be too much of a setback. I think I remember you blogging about the desire to move to a more radio friendly place but being held back by more practical concerns. I don't often comment on your posts, but read your blog regularly. Thank you for all the content! I feel your pain Julian. Having just spent weeks trying to get a usb soundcard to actually work with windows 7 I'm not sure there was actually a benefit in getting it.I do like my pc but it can also make me want to chuck it out the window. But then again I still have a CRT. 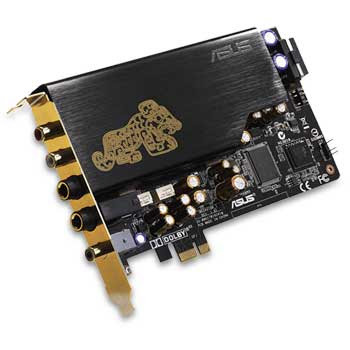 I suspect the reason that nobody makes basic PCI Express soundcards is that the vast majority of users who only have PCI Express slots already have fairly capable sound devices built into their motherboards. Even the server motherboard I use at work has an Intel "HD Audio" device onboard, since aside from the ADC/DAC, it's all integrated into the regular support chipset. As such, most of the people who're after PCI Express soundcards are people with high-end home cinema setups, and musicians who want to do multitrack recording -- both of whom want lots of channels and plenty of dynamic range.